Former champion hurdler Rock On Ruby has been retired after suffering a tendon injury while winning last Saturday's Coral Hurdle at Ascot. 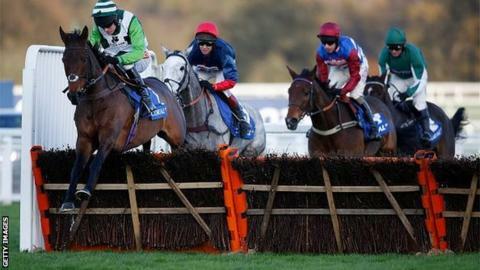 The 10-year-old, who won the 2012 Champion Hurdle race at Cheltenham, had 12 victories from 27 races. Rock On Ruby finished out of the first four just once, in the 2014 Arkle. Trainer Harry Fry said there "were quite a few tears shed by our staff" when he told them that the "horse of a lifetime" was being retired. "If he was a younger horse we might have considered treating the injury and bringing him back a year or more later," added Fry. Rock On Ruby was officially trained by Paul Nicholls when he beat Overturn and odds-on favourite Hurricane Fly to win the Champion Hurdle, but much of the credit for the win went to Fry, who looked after the satellite yard from which he was trained at the time. Can warrior Bobs Worth win Hennessy? Read more on Hennessy Gold Cup: Can warrior Bobs Worth win on Saturday?